Authentic Satya Sai Baba Nag Champa Incense manufactured by Shrinivas Sugandhalaya. 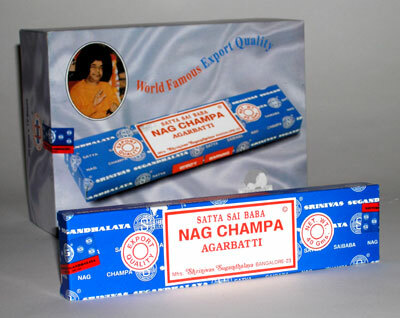 Nag Champa, enjoyed by millions, is the most popular incense in the world. For many people, when they think of incense, they think of Nag Champa. The original blue pack, manufactured by Shrinivas Sugandhalaya in Bangalore, was made famous by the patronage of Satya Sai Baba... and has been a hippie favorite since the 60's!